The Galaxy S4 and the iPhone 5 are two of the UK’s best selling smartphones. In this article, we look at how they compare against each other. If you’re in the market for a new smartphone, the Samsung Galaxy S4 and the Apple iPhone 5 are currently two of the UK’s best selling smartphones. The Galaxy S4 was released in April of this year. Featuring a large 5-inch display and the latest version of Android, the latest member of the Galaxy S family has set new records for Samsung. Selling more than 10 million units in its first month of availability, the Galaxy S4 has only been surpassed by Apple in terms of sales. Meanwhile, the iPhone 5 has continued with Apple’s winning formula. With a ‘Retina’ display, a slim form factor and a selection of more than 800,000 applications, the iPhone 5 is still one of the best smartphones on the market. This article compares the Galaxy S4 to the iPhone 5. We’ll look at the software and hardware behind both devices as well as tariff availability and pricing. 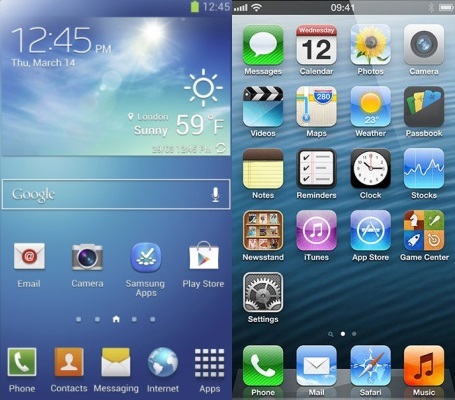 The Galaxy S4 runs Android whereas the iPhone 5 uses Apple’s iOS operating system. The Galaxy S4 comes with the most recent version of Google’s operating system: Android 4.2 Jelly Bean. Android comes pre-installed with a whole suite of Google applications. From the moment you turn on your phone, you’ll have access to the Chrome web browser, the Google+ social network, the Google Now virtual assistant, Gmail and Google Maps (with free turn-by-turn GPS navigation). On top of Android, the Galaxy S4 has been customised with Samsung’s own “TouchWiz” user interface. This adds a range of extra features and applications to Android. For instance, Samsung has added a feature called “Multi Window” to the Galaxy S4. This allows you to split the screen in half and to use two applications at the same time. For cloud storage, Samsung provides 50GB of cloud storage through the Dropbox application. Photos can be configured to automatically sync with Dropbox. The 50GB of free storage expires 24 months after the service is activated. Applications for the Galaxy S4 can be downloaded through Google’s Play Store. According to Google, more than 800,000 apps are available for the Android platform. Most major apps are available including Facebook, Twitter, Skype, Instagram and WhatsApp. Compared to iOS, a larger proportion of Android apps are free. However, many of these apps are supported by advertising instead. The iPhone 5 uses Apple’s proprietary iOS operating system. iOS comes pre-installed with a range of services from Apple: there’s the iMessage service for chatting, the FaceTime service for video calling, Apple’s beleaguered Maps application, the Siri virtual assistant and the Safari web browser. If you’re a fan of Google’s applications, these are also available for iOS but you’ll need to download them separately from the App Store. Compared to Android, iOS tends to be a much simpler operating system. For instance, whilst Android allows the home screen to be customised with widgets (dynamically-updated blocks with information from your apps e.g. weather, stock prices and calendar events), the iOS home screen consists only of static icons. For power users, iOS will feel a little restrictive and perhaps somewhat underpowered. However, those looking for a straightforward smartphone experience may find iOS simpler and easier to use. According to Apple, there are over 800,000 apps available for the iPhone. These can be downloaded from the App Store. Compared to their counterparts on Android, applications on the iPhone tend to be better designed and more aesthetically-pleasing. However, they also tend to be more expensive. If you already have an iPhone, you can continue using your old apps when upgrading to the iPhone 5. If you were to switch to the Galaxy S4, you’d need to buy the apps again from scratch. The iPhone 5 includes 5GB of cloud storage through Apple’s iCloud service. The Galaxy S4 (left) has a more advanced operating system, compared to the iPhone 5 (right). For instance, the Galaxy S4 supports widgets whereas the iPhone 5 is limited to static icons. 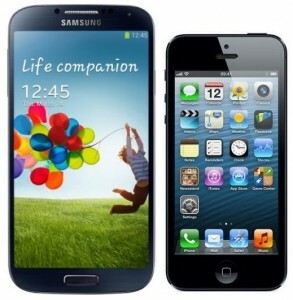 The display is one of the most noticeable differences between the Galaxy S4 and the iPhone 5. The Galaxy S4’s display is 60% larger. The Galaxy S4 has a display that measures 5-inches along the diagonal. This gives it perhaps the biggest display of any mainstream smartphone. It’s 60% bigger than the iPhone 5’s 4-inch display (see our comparison of smartphone size). The benefit of having a large display is that the Galaxy S4 really excels on multimedia experience. Applications and games look particularly good on the large display: there’s also an improved viewing experience for photos, videos and web pages. The downside of having a large display is that the Galaxy S4 becomes a bit difficult to hold. At 5-inches, the Galaxy S4 comes close to “phablet” territory in terms of its size. One-handed usage can be difficult on a large phone and the handset can also feel a little uncomfortable in a pocket. In Samsung’s defence, the bezels are incredibly slim on the Galaxy S4 (the gap between the edge of the screen and the edge of the device) which reduces its size. Compared to other 5-inch devices, the Galaxy S4 is significantly easier to hold. The screen resolution is another significant difference between the Galaxy S4 and the iPhone 5. Screen resolution is measured in pixels (short for “picture elements”). On a mobile phone’s display, each pixel has its own individual colour. Images and text are formed on the display by illuminating individual pixels with different colours. With a larger number of pixels, it’s possible for the display to give sharper images and clearer text. The Galaxy S4 has a full HD display with a resolution of 1920×1080 pixels (1080p). In comparison, the iPhone 5 has a display with 1136×640 pixels. As the Galaxy S4 has almost 3 times as many pixels on its display, it should give much better picture quality. In our tests, this is certainly the case. That said, the iPhone 5 still has a very good display and is certainly not to be scoffed at. It packs its pixels into a smaller area so the text still looks incredibly sharp. The iPhone 5 has a “Retina” display with a pixel density of 326ppi (326 pixels per inch). This compares to the Galaxy S4’s display which has a pixel density of 441ppi. The Galaxy S4 uses an organic LED display. 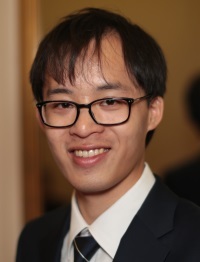 Compared to the LCD displays found on most other smartphones (including the iPhone 5), organic LED displays give better contrast, faster response times and more saturated images. A common criticism of organic LED displays is that colours look over-saturated and unrealistic. The Galaxy S4 suffers from this problem somewhat, though it can be improved by changing a few settings. For more information, see the Galaxy S4 vs iPhone 5 display comparison by DisplayMate. The Galaxy S4 has a “Dual Shot” shooting mode. The Galaxy S4 has a rear-facing 13 megapixel camera. 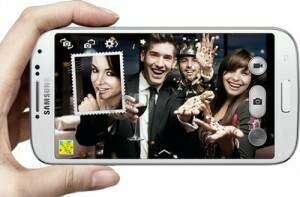 It also has a front-facing 2 megapixel camera. The front-facing camera is used for self-portraits, video calls and advanced features such as Smart Stay (using facial recognition on the front camera to keep the display on whilst you’re looking at it). Samsung provides a range of advanced shooting modes on the S4. There’s a picture-in-picture “Dual Shot” mode that combines images from both the front-facing camera and the rear-facing camera. There’s also a “Drama Shot” mode that captures action and combines it into one photo. Although these features sound great, they’re a little gimmicky and are seldom useful in real-life. The iPhone 5 has an 8 megapixel rear-facing camera and a 1.2 megapixel front-facing camera. Fewer megapixels doesn’t necessarily mean the iPhone 5 has a worse camera – in fact the iPhone 5 is generally applauded for having one of the best smartphone cameras on the market. The general consensus is that both the Galaxy S4 and the iPhone 5 give great photos. The “better” camera is simply a matter of preference. The Galaxy S4 and the iPhone 5 are available across all of the UK’s major mobile networks. For both handsets, you should expect to pay around £35/month on your contract. There may also be an upfront charge for the handset. The following table shows the cheapest contracts available for the Galaxy S4 and the iPhone 5. We’ve considered only the tariffs that are suitable for a typical user of these devices (i.e. contracts with at least 250 minutes each month and at least 500MB of inclusive data). For a more advanced comparison, please use our price comparison calculators for the Galaxy S4 and the iPhone 5. These calculators allow you to customise your comparison by entering the amount of phone calls you make and the amount of data you consume. You can also see the full details of each tariff. This comparison is based on Galaxy S4 & iPhone 5 tariffs that offer at least 250 minutes and 500MB of internet. For a comparison that’s based on your personal usage, please use our price comparison tools for the Galaxy S4 and the iPhone 5. Being the newer device, the Galaxy S4 is in many ways more advanced than the iPhone 5. It has more advanced software, a bigger display, a higher-resolution camera, better battery life and expandable storage via a micro-SD card. As a device, the iPhone 5 is slightly less advanced. It has a couple of benefits: it’s lighter, more portable and is arguably easier to use. For anyone who’s previously owned an Apple device (iPhone, iPad or iPod Touch) the iPhone 5 will provide a more familiar experience and will allow you to use the applications you’ve already bought. It’s also slightly cheaper than the Galaxy S4. Larger & Higher Resolution Display. 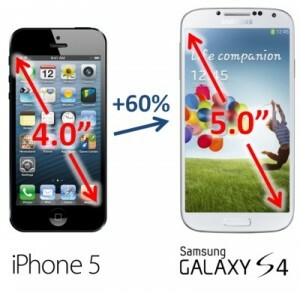 The Galaxy S4 has a 60% larger display than the iPhone 5. This means there is more space available for your content. The display is also at a higher resolution. This means sharper text and clearer images. Better Camera. The Galaxy S4 has a higher resolution camera. It also has a suite of advanced photography features such as Dual Shot. Longer Battery Life. The Galaxy S4 has a substantially larger battery (2,600mAh compared to 1,440mAh on the iPhone 5). Expandable Storage. On a Galaxy S4, you can use a micro-SD card to add up to 64GB of additional storage. It is not possible to storage to the iPhone 5: you’ll need to buy a new device with extra storage. Easier to use. 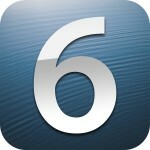 The iPhone 5 uses Apple’s iOS operating system. Compared to Android, which is used on the Galaxy S4, iOS is simpler and is easier to use. The flip side is that iOS lacks some of the advanced functionality in Android (e.g. widgets). Android is a better option for power users. Lighter. The iPhone 5 weighs 18 grams less than the Galaxy S4. Whilst this may appear to be a small difference, it’s immediately noticeable from the moment you pick up the device. Greater selection of apps. There are 800,000+ apps available for the iPhone. Whilst Android also claims to have 800,000 apps, the selection of apps on the iPhone tend to be better quality.